Anyone who has been driving for a long enough time is bound to be familiar with the sickening sound of windshield glass cracking. It may have been from a rock flying from a dump truck or large hail pummeling your vehicle while you are on the interstate and have no where to hide. No matter what the cause, the last thing you want to see while driving home from work everyday is big crack in your line of vision. So what do you do now? The first thing you will probably want to know is whether this crack is a quick fix at a repair shop, or if it will require a costly full window replacement. The easiest way to tell if your windshield can be repaired instead of replaced is by determining just how big the crack is. If it is a chip, take out a quarter and measure it. If the quarter covers up the entirety of the crack, your local auto shop can easily fix it. If you have a longer crack, rather than a chip, take out a dollar bill for measurement. If the crack is the length of a dollar bill (about six inches) or shorter, it can most likely can be repaired fairly easily for a low cost. If you find that your chip or crack can be repaired rather than replaced, it is encouraged that you take your vehicle to a repair shop as soon as possible. The longer you wait to get the crack or chip repaired, the more likely that dirt and grime will get into the crack, making it hard or impossible to repair. 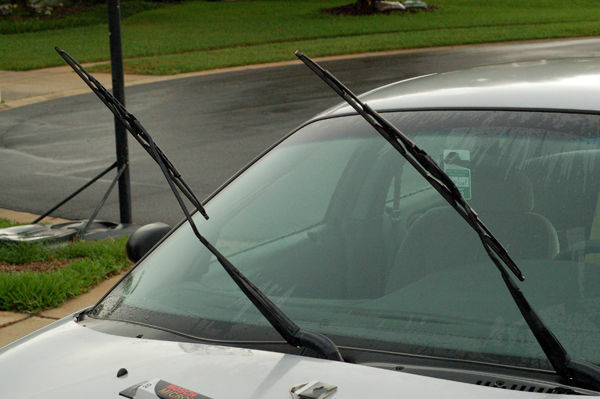 What’s more, it’s also encouraged to take it in immediately because the crack or chip may be easily repaired now, but once your windshield has been damaged, it is very easy for the crack or chip to get larger. If you wait and the crack ends up expanding, you may have to get your windshield replaced after all. If the chip or crack is larger than one of those measurements, however, you will most likely have to get the windshield replaced. Although you may not want to incur the cost of a new windshield right away, it is encouraged that you get it fixed as soon as possible. Large cracks compromise the safety of a windshield, possibly failing to stay intact in the event of an accident or if another chip or crack occurs. No matter if you need your windshield replaced or just repaired, you will want to take your vehicle into the repair shop as soon as you can. The longer you wait, the more danger you will put your vehicle and loved ones in. Before visiting the shop, check with your insurance company to see if the windshield repair or replacement will be covered. If you have comprehensive coverage, you are generally good to go. Written by Marc Laferierre, owner of Dents Unlimited. Dents Unlimited offers the best windshield replacement Columbia MO has to offer, where their expert staff can get your car back on the road in no time.